After a long era of reckless fossil fuel energy development, humans are finally learning how to harness cleaner resources like wind and solar. However, just as their forebears, solar and wind projects can pose threats to local ecosystems. Researchers at the the Block Island wind farm—the United States’ first offshore wind farm, which started producing energy last year—are working hard to address this issue. The stakes are high as offshore wind is finally poised to catch on in America. By some estimates, onshore wind turbines kill up to half a million birds, and an unknown but high number of bats, each year. Offshore wind presents some of the same conservation challenges, including direct impacts like collisions with turbine blades, and indirect impacts like habitat disturbance, according to Taber Allison, director of research at the American Wind Wildlife Institute, a collaborative nonprofit think tank that advocates for responsible renewable energy development. The key to solving these environmental and wildlife issues appears to be good governance based on the best available science. 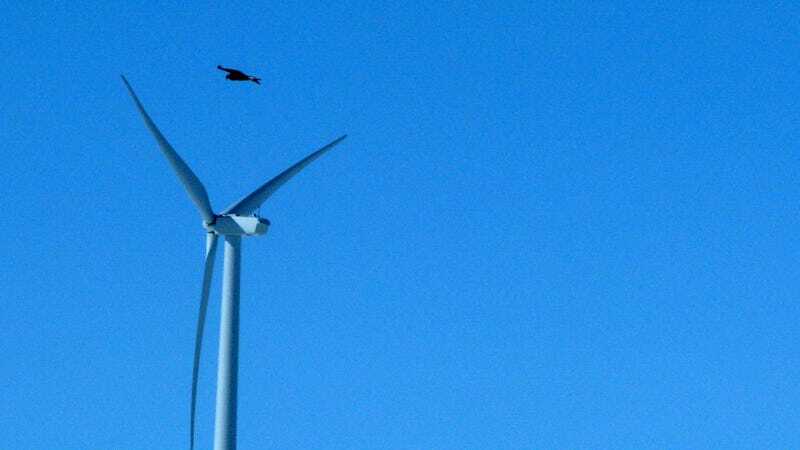 At the 30 megawatt Block Island wind farm located a few miles off the coast of Rhode Island, researchers are tracking birds and bats to learn how they behave around the five 600-foot tall turbines. This is part of a broader effort along the East Coast that could reduce wildlife impacts at future offshore wind farms, of which there could be many. The U.S. Department of Energy has set an ambitious goal of producing producing up to 54 gigawatts of power from between 5,000 and 8,000 offshore wind turbines within a few decades, and the Atlantic Coast is the prime development area. “We have no empirical data on [wildlife] collisions with offshore wind turbines,” Allison told Earther. Offshore wind has huge potential for providing low-carbon energy where it’s needed, near coastal industrial and population centers, as shown by the large-scale use of offshore wind in northern Europe. Offshore wind has been deployed there since 1991, with 3,600 turbines currently capable of producing 11 Gigawatts of electricity—roughly 1.5 % of Europe’s power. Scientists, conservation activists and renewable energy advocates say they’re hopeful we can learn from the mistakes we’ve already made during our endless quest for cheap electricity, but the jury is still out. While the wildlife impacts of onshore wind farms are diminishing, bird mortality is still a talking point in the ideological battles over renewable versus fossil fuel energy, and there are still concerns about wildlife impacts from the rapid expansion of land-based wind farms, said Greer Ryan, a sustainability researcher with the Center for Biological Diversity. Greer says any discussion about energy should begin by acknowledging that we need to cut consumption and increase efficiency, especially considering that Americans use much more energy per capita than every other country. “We have existing areas that can be used for renewable energy development without impacting additional wildlife habitat,” she said, urging deployment of distributed energy systems in previously disturbed areas before exploiting new untouched terrain. Emerging technology, including sensors mounted on blades, as well drones, could help provide better data to integrate offshore wind energy development with wildlife protection, and overall, society has to weigh renewable energy development against the impacts of continued fossil fuel use, said Allison. The wildlife monitoring at Block Island covers two species of seabirds and two species of shorebirds. The seabirds are the graceful common tern and endangered roseate tern, which breed in isolated island colonies along the eastern North American coast. The shorebirds are the piping plover, often seen scurrying along surf lines, and red knots, birds in the sandpiper family that make an annual migration of nearly 10,000 miles, from the Arctic to Tierra del Fuego. Together, the birds comprise a representative sample of species that can help identify possible impacts from offshore wind farms. U.S. Fish and Wildlife Service biologist Pam Loring said the study, which is still in the early stages of data collection, includes pinpointing the timing of various bird movements and weather patterns associated with those movements. Several hundred birds previously tagged with tiny VHF transmitters can be tracked within a 20-mile radius of the wind farm. Loring emphasized different species use the Atlantic Coast at different times of the year. The terns and piping plovers are near Block Island during their nesting period in the spring and summer, while the red knots use the area during their spring and fall migration between South America and breeding areas in the Arctic. Research can help show how to site and operate offshore wind turbines without killing birds at a rate that threatens survival of a species—but it only works if decision-makers use the data. That hasn’t always happened with past U.S. energy development, and it’s not always happening with wind energy in Europe, according to Bruna Campos, a policy officer with BirdLife International. In one case, an offshore wind farm was built in a coastal preserve near the German coast despite warnings from scientists. There’s already a tremendous amount of information available on birds, said Mona Khalil, an energy and wildlife expert with the U.S. Geological Survey. But the science needed to protect wildlife is complex, and often site-specific. For example, some studies suggest that flocks of birds in flyways see wind turbine fields and avoid them. But when birds are foraging, they may be concentrating so hard on prey that they fly directly into the blades. “What we need is information that is spatially explicit. It’s a tremendous challenge to map out how birds fly. There’s a lot of ocean out there, so we try do it for species of concern,” she said. Compared with land based wind turbines, the direct impacts of offshore wind farms on birds are much harder to track, Allison says. On land, you can walk around the base of wind turbines and count dead birds, but that’s not so easy in the oceans. Overall, it seems the onshore wind industry is taking the concerns of conservationists seriously, according to Ryan. “My general sense is, wind developers and industry groups are hearing concerns from people that they want to avoid the direct mortality, and they are investing in understanding those impacts. That said, there’s a long way to go, especially where there is rapid development and pressure for wind development,” she said. But offshore wind is a different ballgame. “It’s so new. It’s just ramping up here, so there’s a huge opportunity to use some foresight. Maybe we can shift our value system a little bit to put more weight on how our actions affect other species and habitat,” she concluded. Correction 9/29: An earlier version of this article stated that Europe’s offshore wind industry is capable of producing 12.5 megawatts of electricity, or about 12% of Europe’s power. It is actually capable of producing 11 Gigawatts of electricity, accounting for 1.5 % of Europe’s power. Apologies for the errors!